In 2009 the number of juvenile offenders newly received by public prosecutors offices was 156,885 (juvenile rate of 9.6%), that for penal code offenses 125,974 (12.2% (id. )), and that for special act offenses 30,911 (5.1% (id.)). By type of penal code offense non-traffic penal code offenses accounted for 100,967 (31.8% (id.)) and negligence in vehicle driving causing death or injury, etc. 25,007 (3.5% (id.)). Special act offenses excluding violations of road traffic related acts totaled 3,214 (2.9% (id.)) (Source: Annual Report of Statistics on Prosecution). Fig. 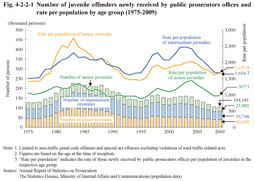 4-2-2-1 shows the number of juvenile offenders received (limited to non-traffic penal code offenses and special act offenses but excluding violations of road traffic related acts) and rate per population by age group from 1975. Intermediate juveniles have been the largest/highest in number and rate per population since 1990, but with junior juveniles were the largest/highest in 2009. 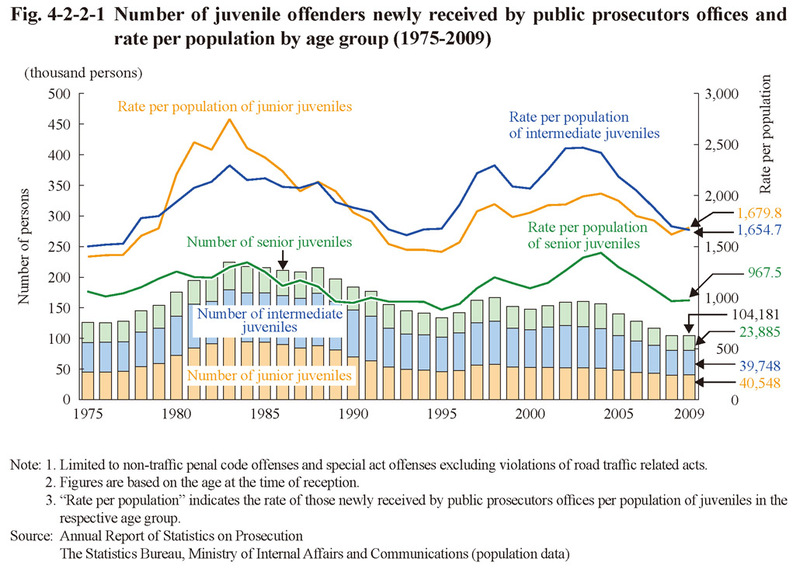 Examining the percent distribution of juvenile offenders newly received by public prosecutors offices in 2009 by age group and type of offense revealed that junior juveniles were the largest in number for injury, intermediate juveniles for extortion, and senior juveniles for negligence in vehicle driving causing death or injury, etc., violations of road traffic related acts, and Stimulants Control Act violations. In addition, junior juveniles and intermediate juveniles were of a high proportion for theft and intermediate juveniles and senior juveniles for robbery and homicide (See Appendix 4-8). Public prosecutors may attach their opinions on the disposition they consider the most appropriate when they refer juvenile cases to family courts. See Appendix 4-9 for the status of those opinions.